VNOG Blog: My commercial premieres tonight! Congrats Victor, it looked great! I was only watching it to see the "Cars" commercial!........aaargh ok...I'm a big American Idol buff....there it is, I said it!!! but the "cars" commercials was deffinitely a big bonus:) Now I'm just waiting for you to direct a Pixar feature, cause I'm sure that day will come and I wanna work on it! ;) I'm not saying this to get my nose brown, but I wanna give you great kudos, because I think you have some of the same things I love about Brad Bird, a great eye for small details and subtle movements that build interesting and entertaining character. One example is the scene in "The Incredibles" where Syndrome wipes his nose and does that little flick with his hand. I love that stuff! I know you can't talk much about it, but I'm guessing, since you're not on the "Rat" movie you're probably working on "Toy Stoty 3" after it has returned to it's rightful owner. 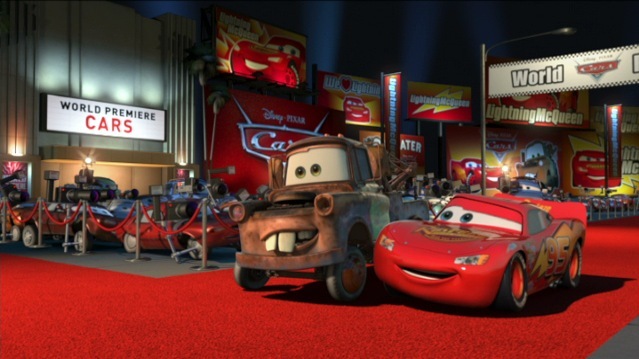 Would Pixar have done a third "Toy Story" if Disney hadn't started it? wow man, great to hear! congratulations, I like your style very much. I love the fact that acid face on the t-shirt has one eye:) I'll watch the commercial tonite..
That's awesome news that you're getting to do some directing Victor!! I see your point about directing a feature. Although I'm sure it's extremely rewarding when it's all over, I'm also sure it's very nervebreaking and stressful from the day you start the project till the day it opens in the theaters. How are things going with your own short "Big Bang" by the way? bah - in the words of chick hicks..."no YOU rock...and ya know that." haha. Saw the ad at least a few times this weekend and halfway through the first viewing I remembered that you might just be the director of what I was seeing. Just came back to the site to make sure, and sure enough, it was yours. Very cool stuff. I have my 4 year old all revved up to see the film (of course, I'm more excited than he is).